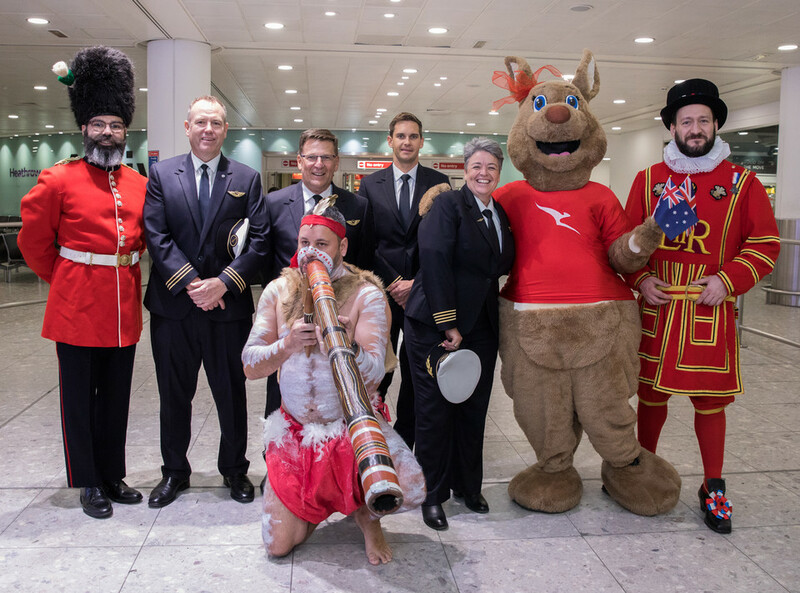 Qantas’ first non-stop London to Perth took off yesterday, marking the start of the only direct air link between Europe and Australia – and the fastest way of travelling between the two countries. The history-making QF10, carrying more than 200 passengers and 16 crew, pushed back at Heathrow around 1pm yesterday afternoon and landed in Perth 16 hours and 40 minutes later. Operated by a Boeing 787-9 Dreamliner, the flight reduces total travel time by eliminating stopovers and taking advantage of the most favourable winds on any given day without having to factor in a mid-point when choosing a flight path. The Dreamliner is one of the cleanest and quietest aircrafts available, making it one of the fastest growing aircraft types at Heathrow, as airlines are encouraged to top the airport’s Fly Quiet league table. Simon Eastburn, Director of Airline Business Development at Heathrow said, “We are delighted to be supporting the very first direct air link between Europe and Australia, a true milestone moment, for a hugely popular route. “The original Kangaroo Route from London to Australia was named for the nine hops it took to get there over four days back in 1947. That initial flight was a modern marvel when it started, and the journey gradually became shorter over the years. Now we can do it in a single leap. “This is hands-down the most comfortable aircraft that Qantas has ever put in the sky. Boeing designed the Dreamliner with features to reduce jetlag, turbulence and noise. We’ve taken that a step further with our cabin design, giving passengers more space in every class as well as bigger entertainment screens and more personal storage. Baroness Fairhead, Minister of State for Trade and Export Promotion said: “The UK and Australia already have a strong economic and cultural relationship – based on our shared histories, language, and open liberal economies. Qantas chose its newest Dreamliner ‘Emily’ to operate the inaugural service, which features a striking livery by Balarinji, based on the artwork Yam Dreaming by Indigenous artist Emily Kame Kngwarreye. The initiative is part of the national carrier’s commitment to promoting the best of Australia to the world. Visit the Qantas website for more information. 1. QF10 is operated by four pilots across the 16 hour and 40 minute journey, with one or two pilots resting at any one time. 3. At 14,498km, QF10 is the third longest commercial flight currently in operation. It is the world’s longest Dreamliner flight. 4. QF10 will carry around 92 tonnes or 110,000 litres of fuel with the Dreamliner burning approximately 20 per cent less than traditional aircraft of its size. 6. Currently, most aircraft have cabin air pressure equivalent to that of an altitude of 8,000 ft. For the Dreamliner, Boeing cut that down to 6,000 ft, meaning its closer to conditions on the ground. 7. Menus for the flights between Perth and London have been designed to maintain hydration, aid sleep and reducing jetlag and including poke bowls as well as classic comfort food. 9. In 1947 a return flight from Sydney to London cost £525 when the average wage was £7. Today, the average Australian weekly wage is $1600 (£880) and a return fare from Perth to London can cost less than $1300 (£720). 10. In 1989, a Qantas Boeing 747-400 flew London to Sydney non-stop, a distance of 18,000kms in 20 hours, nine minutes and five seconds – however, it had less than 30 people on board to reduce weight and required special air traffic control priority to make the distance.